Sleep apnea side effects are associated with repetitive breathing interruptions throughout the night when brain fails to send signals to breathe or your airways are severely restricted by sagging throat tissues. Sleep apnea breathing interruptions can occur anywhere from 20 to 60 times per hour, resulting in lack of restorative and healing sleep necessary for all organs and systems in our body. 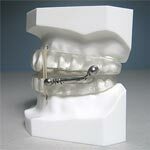 So, let’s try to figure out if a sleep apnea dental appliance could help in your search for a sleep apnea cure. Sleep apnea dental appliance is a mouth piece working in three major directions making its goal to eliminate airway obstructions. One group of sleep apnea dental appliances holds the bottom jaw in a forward facing position, while the other group of oral devices is intended for holding a tongue in place to avoid airway obstruction, and the final category of sleep apnea dental appliances accomplish both of these tasks. It might take some trial and error for you and your dentist to adjust your sleep apnea dental appliance to help you control your sleep condition and make you breathe easier at night. Some sleep specialists strongly believe that most sleep apnea dental appliances may even worsen the symptoms of sleep apnea, while others swear by them and recommend to all of their patients. Along with obvious pros of sleep apnea dental appliances there are still some cons like lack of intimacy with your partner at night with a dental piece on and possible minor gum irritations and increased saliva production. In a case when sleep apnea dental appliance and all other natural sleep remedies are not working for you, your doctor might strongly suggest surgery to remove some of the extra tissues from the back of your throat that might interfere with the correct breathing at night. Deviated septum rhinoplasty procedure might also be helpful for individuals who have difficulties breathing through their noses at night.